Thanks to today’s productivity software, collaboration tools, and remote access technology, work is more flexible, connected, and collaborative than ever. We’re less tethered to our desks and more connected to each other. From remote workers to business partners, clients to suppliers, we’re more connected than ever before. Meeting spaces are an essential component of collaboration. According to research reported by Forbes, employees attend upwards of 60 meetings per month.1 Where do all these meetings take place? How do you tailor meeting spaces for all these different needs? That’s the issue many companies are struggling with. Thanks to the proliferation of open floorplans, many organizations now have fewer offices, driving the demand for additional meeting spaces of all kinds—and the technology they require in order to facilitate communication and collaboration. Unfortunately, workers can waste a lot of time setting up meeting technology, including connecting presenters and their devices and content as well as connecting remote participants. In fact, in the typical conference room, setting up video conferencing wastes up to 10 minutes of time each meeting. You then lose time mid-meeting by passing control to other meeting presenters, changing presentation platforms, looking for the right dongle, waiting for inputs to connect, and accessing content. How do you make sure your meeting spaces are ready and able to meet the tasks at hand? How do you make sure the meeting technology is helping productivity rather than hindering it? The right meeting room design—and the right collaboration tools—can make all the difference. By paying attention to specific details, you can make your company’s meetings more productive, more efficient, more interesting, and more secure. Your users can interact and collaborate more powerfully, so they can get more done in the moment instead of taking notes on how to get more done later. When it comes to meeting spaces, one size doesn’t fit all. Gone are the days of repurposing a solitary conference room for all your meeting needs. Companies now need a selection of meeting spaces that meet the needs of different teams and different workers, as well as the needs of clients, business partners, and other visitors. Modern meeting spaces meet these purposes not only through traditional conference rooms but rooms of all sizes. Huddle spaces for three or four people. Focus rooms for one-on-one meetings. Phone rooms for individual calls, so they don’t disturb the rest of the office. Make a strong first impression, with a visually pleasing appearance and a configuration that is appropriate for the room and the meeting purpose. Equipped to support multiple communication and collaboration methods. Equipment is easy for users to connect, operate, and troubleshoot. Provide ample and convenient power sources and reliable wireless connectivity. Display is appropriately positioned and sized for the room, providing good visibility for both text and graphics, with an articulating arm if necessary. Comfortable, with adjustable chairs that accommodate different body types, at least three feet of stretch space around the table, even lighting that causes no glare, and sufficient upholstery, carpeting, or window coverings to prevent acoustic issues like echo and reverberation. Design reflects the company’s personality and brand, whether that means a particular décor or a meaningful conference room name. Provide the collaboration capabilities that enable an immersive, engaging, and collaborative experience, starting at the first minute of the meeting. What constitutes an “appropriate configuration” depends very much on the size, shape, and purpose of the room. Rooms may be configured with small round or square tables for small groups—tables that keep any one person from being at the “head,” while U-shaped tables very much put a central focus on a presenter or display. Theatre-style seating maximizes capacity for large groups, while classroom seating enables note-taking and use of laptops. Traditional conference tables facilitate face-to-face collaboration, especially boat-shaped tables that keep people from sitting in a straight line. These tables improve visibility both around the table and toward the focal point. Finally, informal discussion areas may call for comfortable and more modular seating and tables. Of course, having more meeting spaces provides no advantage if those spaces aren’t equipped with the technology users need, whether for brainstorming, group presentations, video and teleconferencing, workgroup sessions, large group meetings, or other purposes. Additional technology factors to consider include the end-user device platforms you need to support, capabilities for integration with other communication and collaboration technologies, and product support options for your meeting technology solutions. 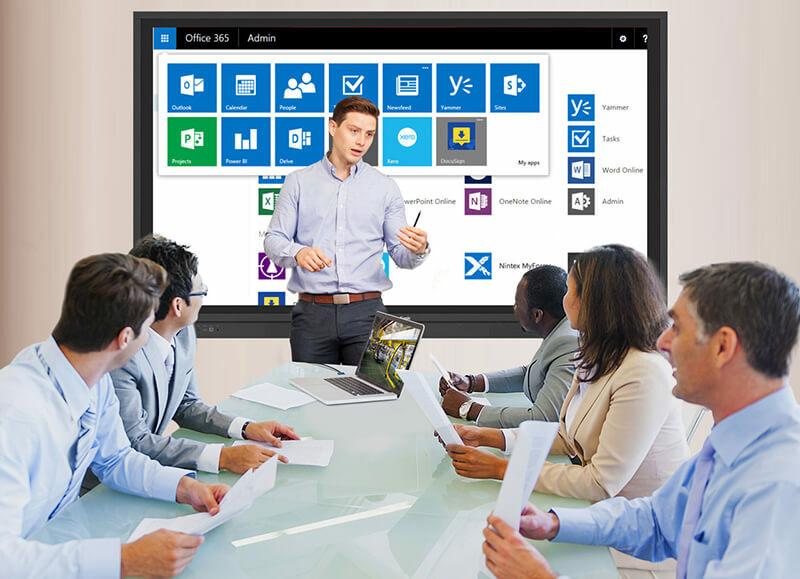 The ViewSonic® ViewBoard® solution pairs the ViewSonic ViewBoard interactive large flat-panel display with ViewSonic cloud-based myViewBoard™ software to boost communication and collaboration no matter the meeting space or purpose. 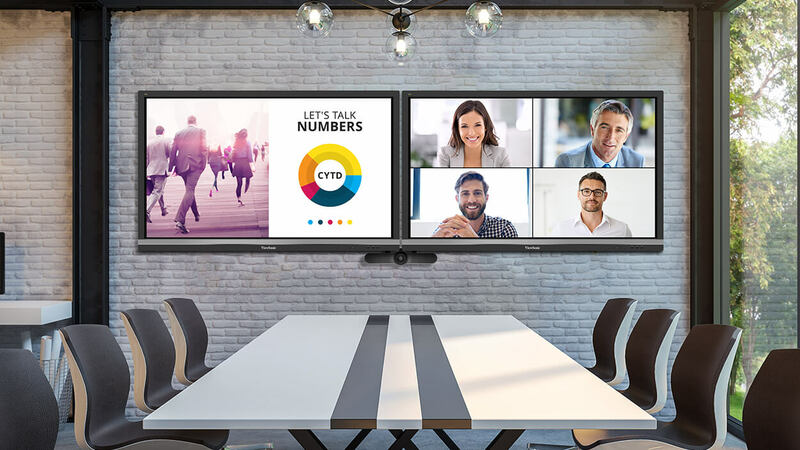 Dramatically increasing the business value of meetings, ViewBoard and myViewBoard combine enterprise-level security, cloud storage integration, digital whiteboarding and annotation, multicasting, and other advanced features to enhance the way your team connects and collaborates. Powered by Amazon Web Services and protected by AES-256 encryption, myViewBoard software ensures that everything from corporate secrets to school test scores remain safe from unauthorized access. It provides multiple authentication options, including fingerprint reader, password, and QR, along with a cloud-based single sign-on portal. Whereas competing products can introduce security limitations and concerns, once logged out of myViewBoard, all access and temporary files are deleted, leaving no trace. The ViewBoard solution allows you to store documents, images, and other content directly onto a shared cloud drive such as Google Drive, OneDrive, Dropbox, and Box. With myViewBoard, your files are just one touch away and can be accessed, retrieved, and saved from anywhere. The ViewBoard solution offers an enhanced, full-featured touchscreen canvas that includes a variety of annotation tools that let users write, draw, markup, control the screen, and save content using fingers and styluses. 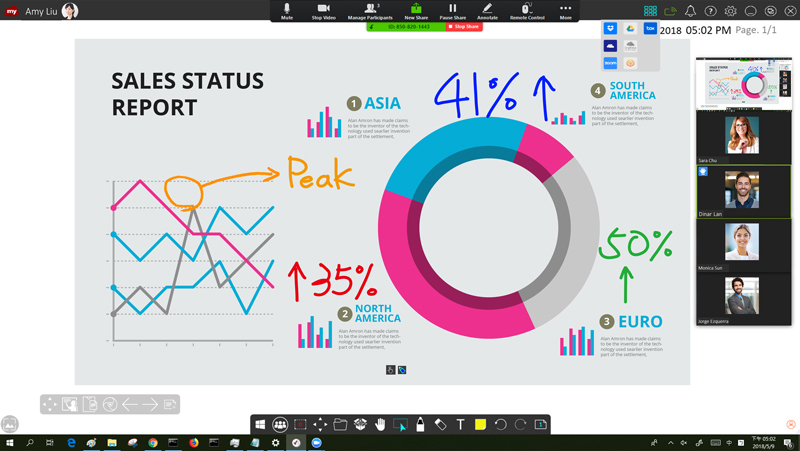 Multi-color pens and customizable backgrounds let you personalize presentations, and user-friendly handwriting recognition transforms handwritten words into typed text. Unlike competing products, the ViewBoard solution allows screen annotation over multiple input sources and supports multiple whiteboarding software options. The ViewBoard solution provides powerful casting and multicasting features, with support for multiple wireless screen-sharing software options. 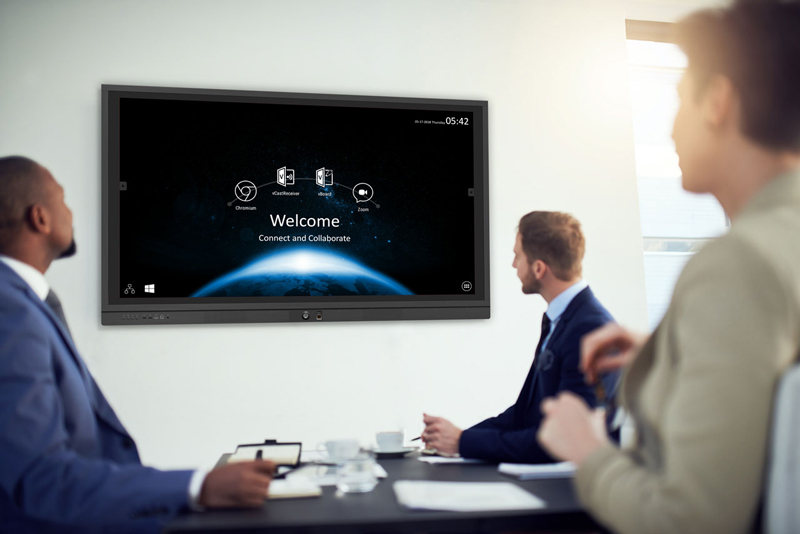 With myViewBoard, multiple users—including remote users—can control the board from their own devices, allowing participants to engage in a presentation in real time. A built-in screen camera records, saves and plays back presentations for easy sharing. In addition, meeting participants can send—or “throw”—files, images, and other content from their devices to the ViewBoard, to supplement the presentation or discussion. ViewBoard displays and myViewBoard software offer support for the full range of end-user devices, including PCs, Macs, Chromebooks, and Android devices. 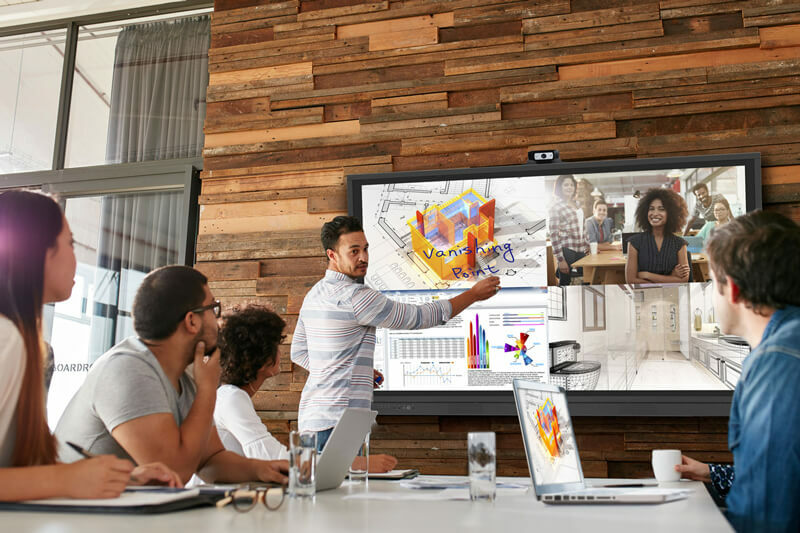 Hardware components include a 6th-generation Intel® processor (along with generous memory and storage), support for 4k video, an optional slot-in PC for a Windows® 10 experience, dual integrated speakers, and an optional Logitech® camera for video conferencing and recording. The displays are available in multiple sizes to suit any meeting space, with accessories such as wall mounts, floor mounts, trolley carts, and tabletop stands. ViewBoard display is backed by a three-year limited on-site warranty with support provided directly by the vendor, not the reseller. The ViewBoard solution provides easy, in-menu access to YouTube and other browser resources. It also provides software integrations with Intel® Unite™ unified communications application and with Qwizdom™ educational software products. ViewBoard display is also now integrated with Zoom communication and collaboration software via Zoom’s SDK and API platforms. 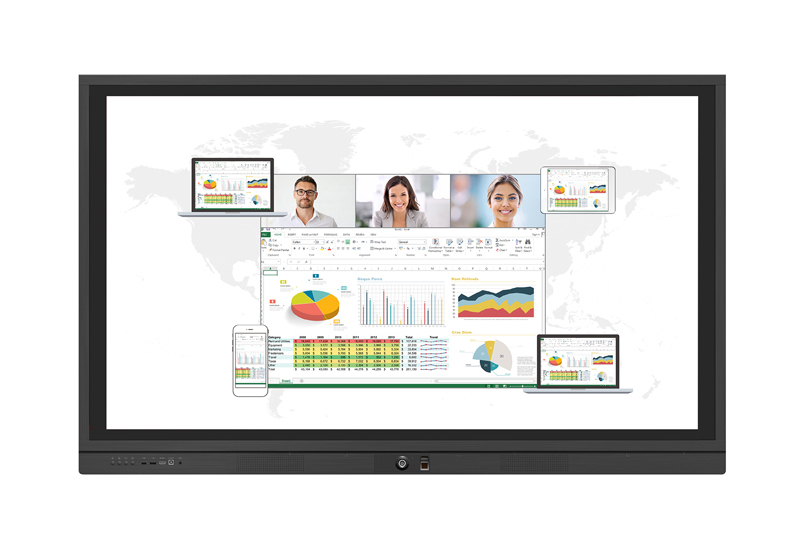 This access to Zoom software adds even more tools and functionality to the myViewBoard collaboration software already included with ViewBoard interactive displays, including enabling users to host video conferences directly from the myViewBoard interface with a single click. A well-designed, well-equipped meeting space provides exceptional meeting experiences that can increase knowledge-sharing, encourage problem-solving, capture creativity, and accelerate innovation. These meeting rooms can pay for themselves through higher user productivity and business value. ViewSonic ViewBoard technology plays a central role in bringing collaboration to life. Learn more about ViewSonic ViewBoard displays and myViewBoard software today. 2 Barolo, Priscilla, “Your Mission: Build Conference Rooms Without Getting Fired,” Zoom, May 24, 2016. 3 Alspach, Kyle, “The 5 Best-Selling Collaboration Display Brands Of Q1 2018,” CRN, June 4, 2018.